I’ve been looking into getting trained in the Community Resiliency Model (CRM). CRM is a training anyone from the general public can take and covers 6 of the 9 Skills that are taught in the Trauma Resiliency Model (TRM) training (which is more geared to therapists and health practitioners). CRM teaches Tracking, Resourcing, Grounding, Gesturing, Help Now! and Shift and Stay and TRM, in addition to those six, teaches: Titration, Pendulation and Completion of Survival Responses. I noticed that people are not taught Titration directly as its own Skill in CRM. Most likely titration is mixed into the other skills that are taught – they probably explain how slowing down and taking things bit by bit while using any skill increases that skill’s effectiveness. When making these observations of the training, I realized that Titration is one of the most important somatic related skills I have learned so far and is so crucial I would place it at the front of the pack. Titration is the act of slowing down your response, be it emotional or physiological, to a VERY VERY slow pace. You become the director of the pacing of your processing, making it extremely slow, in effect opening up more space for the settling and integration of numerous activation/arousal responses and all associated information coming at you at once. Titration is the skill set that involves managing the speed of processing. Titration is the act of taking only a tiny piece of your response to deal with – a VERY tiny piece – and leaving the rest for another time. You become the director of how much you process at one time. Titration is, therefore, also the skill set that involves managing the amount of content to be processed. I personally like to call Titration “Slowing.” To me that is easier to remember. But it’s actually “Slowing and Parsing”, or “Slowing and Separating” – that would more accurate. Or “Slowing and Portioning” perhaps. My sense of it right now is that Titration is one of the most important Skills there are to STOP re-traumatization both by a person’s own approach to themselves and a therapist’s approach to their client. Titration / Slowing and Portioning is so important because – if you think about it – one key characteristic of trauma is having too much come too fast. So, titration is doing the exact opposite of what trauma does, it deliberately reverses too much, too fast by enacting a little bit, slowly. Titration is the opposite of trauma: Trauma is too much, too fast; titration is a little bit, slowly. If you “titrate,” you have a flask of one substance, and you drip another substance into it. At a certain point there will be a reaction. Because you were going so slowly, and measuring everything so carefully, you gain an understanding of a property of the chemical (the concentration of something within it) that you would not have gained by just dumping one chemical into the other willy nilly. 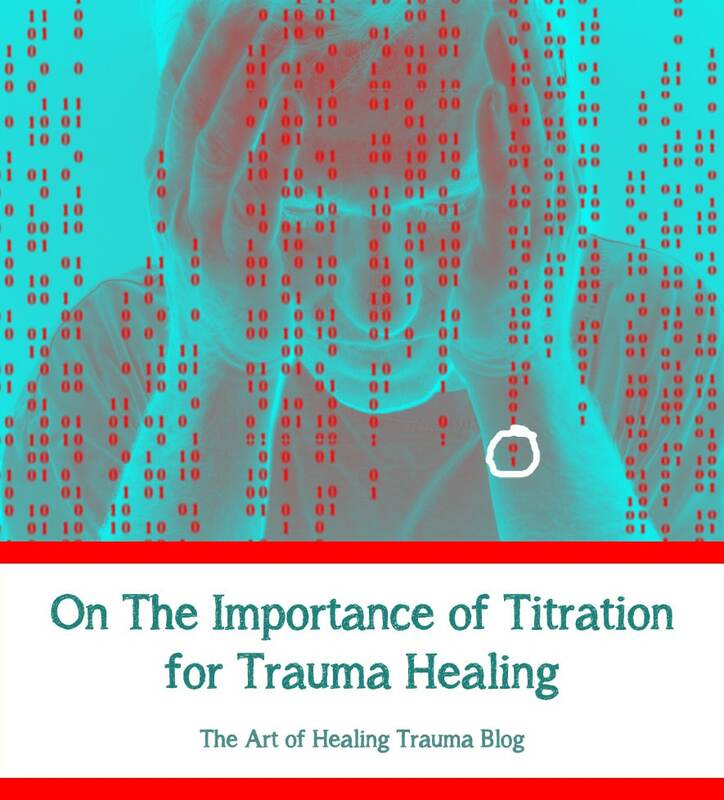 Somatic Experiencing therapy talks about “titration” as an important concept for healing from trauma. The idea behind this, when it comes to human psychology, is to carefully introduce something, in this case the memory of trauma, in tiny drips, monitoring the reaction that this produces at every drip. So, we can see by looking at how titration is used in chemistry that beyond just enabling processing and protecting against re-traumatization, titration also enables you to gain more information about the inner landscape and what is occurring with it – it makes it possible to gain information that you otherwise would miss entirely. This information can inform the entire therapeutic approach. Titration also allows for the natural functions of the nervous system to surface, the natural rhythm and flow between different states, without any imposition – so, you aren’t forcing the system to pendulate. Because you are going so slowly, you are allowing the system to find it’s natural pendulation, or flow between one state to the next, on its own. This opening up of space allows for the innate, natural pendulation between parasympathetic and sympathetic to begin to become established again. Little by little, Slowing and Portioning / Titration can serve to unwind and pick apart the past moments of having people intrude their reality onto a person’s inner experience – whether it be a parent telling a child to “Hurry Up!” when the child just experienced a serious emotional trauma, a teacher judging and ridiculing a child, bullies, or adulthood relational trauma. Titration is, therefore, an agent of de-repression. Slowing and Portioning / Titration skill can sooth and heal fracturing, splitting, disintegration and shattering from the worst traumas all the way up to subtle separations from one’s sense of self due to critical moments of being discounted, abandoned and neglected. helps you gain more information about the inner landscape and what is occurring within it, which can inform the way the therapy progresses. Heidi Hanson is an artist and writer in Asheville, North Carolina currently working on an illustrated book chronicling her journey healing from Post Traumatic Stress Disorder.